American Vandal has no right being as good as it is. Created and written by Tony Yacenda and Dan Perrault, the show ostensibly parodies true crime shows (most predominantly fellow Netflix series Making a Murderer), but like any good comedy, it aims to satirize contemporary life. For the first season, the show’s central mystery revolves around an act of graffiti in which a student draws phallic imagery on every faculty car at their high school, and it seeks to answer, to quote the show’s constant refrain, “Who drew the d*cks?” Is it crude? Most definitely. 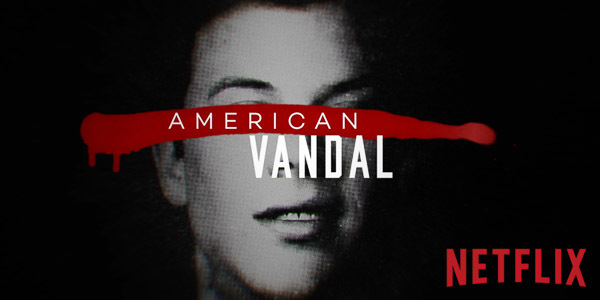 But despite how crude American Vandal is (and it is—even more so its second season), the show somehow transcends its sophomoric humor and becomes one of the most compelling mysteries on television. The pilot mostly presents the characters and the list of potential suspects and establishes the tone. Like Making a Murderer, the show’s “documentarians” posit that the person who’s been labeled guilty might actually be innocent, and they attempt to present his case. The entire mystery and investigation is played completely straight—even though the mystery is “Who drew the d*cks?” But this tone is what sells it, and the mockumentary style allows Yacenda and Perrault to slip in valid commentary about today’s youth culture and how they interact with online life. The second season even forgets to tell jokes for the last five episodes and instead offers a unexpectedly moving commentary about how the internet has supplanted everyday life. And the second season’s villain is the “Turd Burglar.” (It’s much more disgusting than it sounds.) It takes a deft hand to pull that off. Even if juvenile humor isn’t your thing, American Vandal is worth checking out. If you’re reading this, you’re either on a computer or a smart phone. And if you’re anything like me, you probably spend a large portion of your day staring at a screen of some kind, and a large portion of your interactions with humans are on one of those screens. Our real lives are becoming more and more intertwined with our virtual personalities, and who we are online is who we are. American Vandal is one of the first shows to explore the actual implications of that, and as a result, it’s more compelling than it has any right to be.